Welcome to the NLP library! NLP is a modern communication tool and systematic approach to personal development. It is used in the therapeutic area, as well as in the business contexts and many other fields. 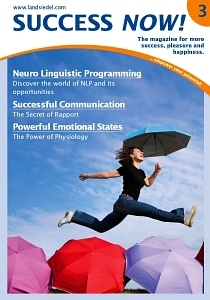 In this NLP library the most important NLP formats, methods, names and terms will be explained. I would like to use this library to contribute to the spread of NLP. Of course, all texts are subject to the copyright of landsiedel NLP Training and must not be copied. Suggestions are welcome in order to continuously develop this library. Here you will learn more about the NLP fundamentals and the most important formats and method. Master communicators encounter their conversation partner in his experience of the world and are able to lead him based on the experience. Learn the art of deep trusting contact and leading the conversation through verbal and non-verbal communication. Immerse yourself in the sensory world of your conversation partner to gain deeper understanding and to be understood. This "sensual awareness" opens you unexpected levels of communication. Simplify your everyday life and improve your customer relationships with the knowledge and use of our natural conditioning mechanisms. You will learn to specifically create a positive emotional reactions and dissolve limiting ones whenever you want it. Become aware of the magic of your language. It is not only the foundation of clear communication, but also of fast and targeted change. Through acquiring this NLP technique you gain use of today´s leading language tools. You will become a master at spoken language. The ability to examine a behavior or a situation from different perspectives makes our mind free and flexible. Train your ability to recognise different meanings and considerably increase your options in difficult situations as a result. Unfold your unconscious potential by learning and applying the Milton-Model of Language. Hypnotic language patterns allow you access to trance states and thus to consciousness levels that were previously closed to you. Use this NLP technique to discover the programming language of the subjective experience. This high-profile tool allows you to quickly act on the emotional life and annoying habits or to get rid of fears. Human behavior is controlled and managed by the strategies behind it. NLP provides you with various methods to learn the strategies of experts, such as the Disney´s creative strategy. That way, you can optimise motivation, learning, sales and decision-making processes. Remove unpleasant habits and negative thoughts from your life. Enjoy feeling balanced, reacting calmly to your environment and see challenges from different angles. Make the most of your time line in order to systematically plan your goals and get clarity about the integration of past experiences into your future. You will develop a compelling vision. The self-concept is the image, the idea, which we have developed ourselves. It refers to how we perceive and define ourselves. Our self-concept significantly influences our thinking, feeling, our motivation and performance, our learning and our behavior. A belief is the linguistic term for something that someone believes to be true. In NLP, beliefs are an expression for inner models that each person continuously designs. We constantly need to do so to orientate ourselves in the world. Other terms for this are: Beliefs, attitudes, opinions. Each person uses his personal value, in order to move towards his goals and desired results. The alignment between your current actions and personal values results in the feeling of personal fulfillment and integrity. The neurological levels have been developed by Robert Dilts and are applied in numerous NLP formats today. The model is very useful for modeling, defining goals and planing personal changes. "A method which allows you to access states within five minutes that others only reach after sitting on mountains for years!" The starting point of the core transformation is an unwanted behaviour with the goal of developing a new internal communication. Very beneficial and effective! Meta-programmes are personal filters in perception. They are structures and patterns of our mind that determine our thinking and behavior. They determine how we distort, delete and generalize information. Metaphors play an important role in communication and own understanding. Since time immemorial, metaphors serve as an instrument for teaching and changing ideas and attitudes towards life. The spiral dynamics model is the extension of the biopsychosocial model of human development of Clare Graves which is based on maslow's hierarchy of needs. The model is by far not as popular as the one of Maslow. The Diamond Technique can be seen as a complement to other NLP techniques. It is used to work on problems or boost creativity. Goal of the technique is not necessarily to solve problems, but rather to resolve them by gaining new points of view and insights to see or understand the problem differently. Modeling is the core discipline of NLP. If we were to think back to the history of NLP, all strategies and techniques were developed by observing top performances of experts in their fields, breaking them down into small chunks and making them available to others. By means of Sleight of Mouth patterns, core beliefs can be established, changed or transformed. Threfore, these patterns can be considered as verbal refraimings of beliefs. Many of the concepts of the great family therapist Virginia Satir were directly integrated into NLP. Here are some methods that were not directly integrated into NLP.